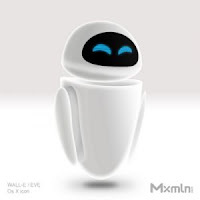 Having now watched WALL-E for the second time, I am once again amazed at how little is required to breathe life and emotion into a character. There is practically no dialogue at all in a large part of the movie, which is pretty incredible in itself, but what struck me the most was the simplicity of the face of EVE. She has only eyes. No eyebrows or even pupils. No nose, no mouth, no malleable flesh to move around. Just eyes. And yet she has so much character and is able to communicate and show emotions really successfully. Using just her eyes. Granted, the tilt of the head, the speed of the movements, the sound effects and other obvious or even subtle elements of scene itself, all contribute to getting the message across, but EVE is basically a floating shiny white egg, with eyes (and occassionally arms). So the lessons I have learnt from EVE: 1. 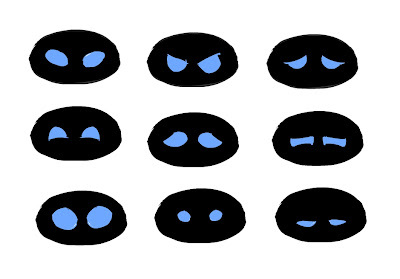 How easy it really is to present an emotion by simply changing the basic shape of your characters eyes. and 2. Your eyes will always give you away.